20-sim 4C uses an ethernet connection to communicate with a target. This connection can be established using a cross cable that is connected between your PC (the host PC) and the target directly or by connecting your PC and the target to your local network. 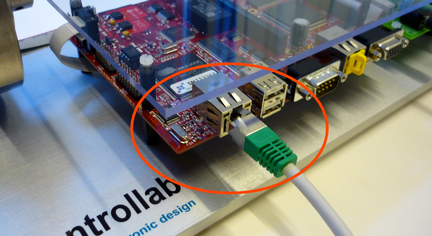 Using a cross-cable to connect the host PC directly to the target is recommended if you encounter problems with the connection. Plug in the cross cable or network cable. 1.Plug the cross cable in the connector of your target. 2.The other end of the cross cable must be plugged into your host PC. It may take several minutes before Windows has configured the network interface. Please be patient when 20-sim 4C cannot make a connection immediately. 1.Plug the network cable in the connector of your target. 2.The other end of the network cable must be plugged into a switch or hub of the network. Use a 'normal' network cable to connect the target via a switch or hub to your network. If your network provides a DHCP server the configuration is automatic. If your network does not provide a DHCP server make sure your network is configured in the 192.168.1.x range and that your PC computer has a proper connection to the network. See Networking in the Troubleshooting chapter in case you experience problems.